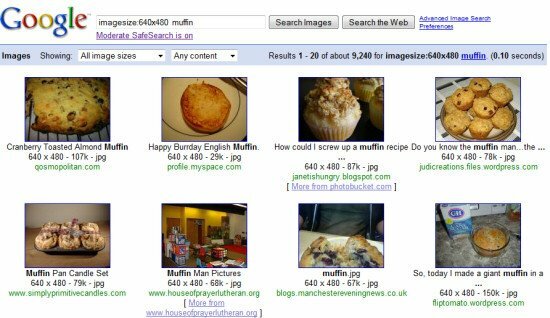 Here's an example: [imagesize:640x480 muffin] finds 640px x 480px images related to muffins. The operator could be useful if you need to find wallpapers for your computer, logos, illustrations for a school project or any other images that have standard sizes. Thanks so much for this tip...I hate how the S,M,L options don't tell you their ranges and also make it annoying when you know the exact size you want. Did this parameter only become available recently? Thanks for featuring my tip! Hmmm... Still waiting for the day when I can define my own S/M/L/XL size preferences... Back in the day, working on 1024x768 with a standard 96 dpi screen, an 800x600 image of something was sufficiently large to be classified as medium; unless you want to print it, but for viewing it's fine. These days however, on a 1920x1200 screen with a 192 dpi, an 800x600 image ends up being a little blob of color in the top left corner of the screen, and thus deserves the "small" label. Approximate proportions might be more useful than exact sizes? Do I want one that's portrait, landscape, a banner etc? I absolutely HATE the igoogle. I want the plain google page back. this is irritating distracting and a mess! Can anyone out there tell me how to get my old Google page back?